In September 2014 the Brazilian production facility, where all our machineries are manufactured, has been inaugurated in Guaramirin city of Santa Catarina’s state. So we can ensure all the technical assistance and spare parts services to all ours South America’s Customers. In order to improve the range of products to be offered, we signed a cooperation agreement with two other companies: the Italian OMSG Officine Meccaniche San Giorgio and the Spanish ONDARLAN. OMSG-world leader in the design and manufacture of shot blast, shot-peening machines and machine systems. ONDARLAN manufactures machines and complete resin sand moulding plants (No-Bake), continuous mixers and sand reclamation plants. 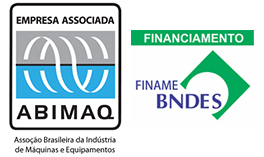 Euromac América Latina - Equipamentos para Fundição Ltda.